The $50 billion price tag is more than 25 times higher than that of the last winter games, in Vancouver, Canada. One year before they kick off, the Sochi Winter Olympics have already bagged a world record. They will go down as the most expensive games in history. The cost will top 1.5 trillion roubles ($50 billion) in state and private investment, and three-quarters of that sum has already been spent, as shown in figures released Friday by the governmental commission overseeing preparations for the games. Since preparations began in 2008, organizers have spent 1.14 trillion roubles on sports and road infrastructure and other measures, according to documents released ahead of the first meeting of the commission chaired by Deputy Prime Minister Dmitry Kozak, Prime reported. The $50 billion price tag is more than 25 times higher than that of the last winter games, in Vancouver, Canada. The 2010 Olympics cost an estimated $1.8 billion, or $2.5 billion if calculated on the basis of generated real gross domestic product, a study by PricewaterhouseCoopers shows. Sochi also overtakes the Beijing Summer Games of 2008, which cost $40 billion and have been rated the most expensive Olympics so far. The cost of the Sochi games is higher than that of all previous winter Olympics combined, opposition politician Boris Nemtsov said in an interview with online television platform Politvestnik posted Friday. It was not clear whether his estimates were in real or nominal terms. The high cost has been explained by the almost complete lack of adequate local facilities. Jean-Claude Killy, the chairman the International Olympic Committee's coordination commission for the Sochi games, has said that 85 percent of the infrastructure had to be built from scratch. Kozak said at Friday's commission meeting that of the money spent so far, some 200 billion roubles went into sports infrastructure construction. Upgrading city infrastructure cost an additional 500 billion roubles, with transportation requiring the biggest share, he said. However, the figures have risen massively over the years. They are now more than four times higher than they were in 2007, when President Vladimir Putin won the games and pledged $12 billion to develop Sochi into a world-class winter sports complex. Allegations of cost overruns and mismanagement have dogged the preparations for years. Olimpstroi, the state corporation in charge of the construction, has had four presidents in four years. Government officials have downplayed criticism over the ballooning costs by pointing out that two-thirds of the amount is covered by private investors. The commission figures released Friday show that private-sector investment stands at 737 billion roubles and is supposed to reach approximately 1 trillion roubles. Critics say the lion's share of the sponsoring companies are state-controlled, meaning that much of their money also comes from state coffers. The games' general sponsor is Rosneft, and the official list of sponsors on Olimpstroi's website includes more state giants, like Russian Railways and Gazprom. The construction costs have also been alleged to be inflated by corruption. A report on the Svpressa.ru portal last week cites a former construction entrepreneur identified as Vyacheslav Alexandrovich, who says on his blog that typically 20 percent of a given project's cost is imaginary so that money can be funnelled into the pockets of private interests. Many questions have also been raised over the investments' future use. 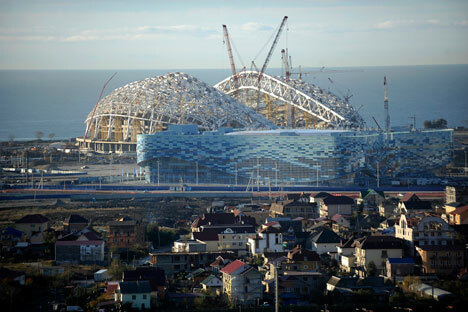 Critics say the Olympic venues risk becoming huge white elephants, not least of all because prices in Sochi and the surrounding resorts are too high to be competitive with alternatives in Turkey and Europe. Kozak, the deputy prime minister in charge of the Olympics, said the government would focus on getting infrastructure ready in time. He identified power outages as a major problem and acknowledged that not all sites have a reliable energy supply. To solve the problem, government agencies, power companies and distributors need to work together “to guarantee a 100-percent-functioning power supply,” Kozak said, according to a transcript on the government's website. The deputy prime minister also said visas would be a problem. He said Sochi airport border guards had difficulties last week when five airline staffers arrived without valid visas. “During the Olympics, this might be 500 people at once … and we will have to solve that on the spot. These emergencies must be kept a minimum,” he said. Putin has said he wants visa-free travel with European Union member countries in time for the games, but EU officials have poured water on those hopes by saying that negotiations might not even begin before 2014. Kozak also said finishing hotel construction was a priority. Among the international hotel chains hoping to capitalize on the growing tourist influx to the Black Sea resort during and after the Olympics are Rezidor, Hyatt and Starwood.